C. Weinhardt, Jr., Robert Indiana, New York, 1990, pp. 146 and 150 (illustrated in color). Robert Indiana, Rétrospective 1958-1998, exh. cat., Musée d'art moderne et d'art contemporain, Nice, 1998, p. 239 (illustrated in color). S. E. Ryan, Robert Indiana: Figures of Speech, New Haven, 2000, p. 268. Humlebaek, Louisiana Museum, American Art 1950-1970, September-October 1971, pp. 24 and 40, no. 15 (illustrated). Philadelphia, University of Pennsylvania, Institute of Contemporary Art; Houston, Rice University, Institute for the Arts and Akron Art Institute, The Highway, January-July 1970, p. 38 (titled Terre Haute; illustrated in color as frontispiece). Robert Indiana's most profound and visually stimulating works are composed of the familiar yet coded iconography that he developed to represent his personal mythology. Indiana, who is often associated with Pop Art, transcends this label through his unique pictorial language that mixes the everyday materials of the street with autobiographical allusions. His works create a dialogue between the anonymous and factual and the intensely personal and subjective. However neutral or simple the composition may be, his works reveal rich layers of history and memory. The present work, Terre Haute No. 2 is the second of two works of this subject, the first of which Indiana painted in 1960, around the time that he changed his name from Robert Clark to Robert Indiana. The paintings are autogeographical, and although the artist lacked a personal connection with the city, he told Richard Brown Baker that the first painting in particular was "an homage to my home state" (R. Indiana quoted in S. Ryan, op. cit., p. 83). Susan Ryan writes, "As such, [Terre Haute (No. 1)] is the first of many works that (like his new name) refer back to his place of origin, or to significant locations in his life...These paintings may have issued from an impulse like the one that the autobiographical scholar Elizabeth Bruss assigns to those of somehow uncertain birth and parentage: for such individuals, 'a birthplace becomes a spiritual as well as a physical location, and the knowledge of it a source of self-control'. The artist himself echoed this impulse in a roundabout way when he spoke of Terre Haute in terms of his birth. Although he never lived there, he said, the town 'intrigued me because it's on the opposite side of the state from where I was born...on the west side of Indiana [and] New Castle is on the east side'" (Ibid). Indiana painted this second version, Terre Haute No. 2, in 1969, toward the end of a period of production that included the critically acclaimed American Dream series, which solidified his aesthetic lexicon of signs and signifiers. The first Terre Haute painting reads as a landscape; "Wabash" and "40" float sinuously across the earth-toned horizon line, a fitting motif since they represent the river and the highway that run through the state of Indiana. Terre Haute No. 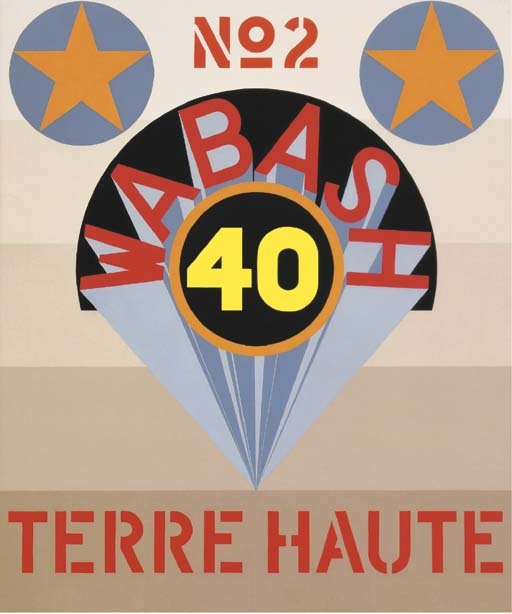 2 retains the earthy background palette of the first work but locates "Wabash" and "40" at the center of the composition in Vegas-style headlines and colors, and frames them with heroic stars. The painting is both commemorative and celebratory. While the first painting is evocative of the artist's home state, the second painting reflects the changes to his life and self-identity and, as a result, presents a transformed state of mind. Indiana selected Terre Haute No. 2 as one of the ten most important paintings that he completed between 1960-1969 which he reproduced in a portfolio of serigraphs produced by Multiples in 1971.